Trim can of course be pos or neg. O2 reading can't be negative. Is that an actual print out from the OBD II scanner or is that just a typo on the part of the OP while he was preparing this thread. 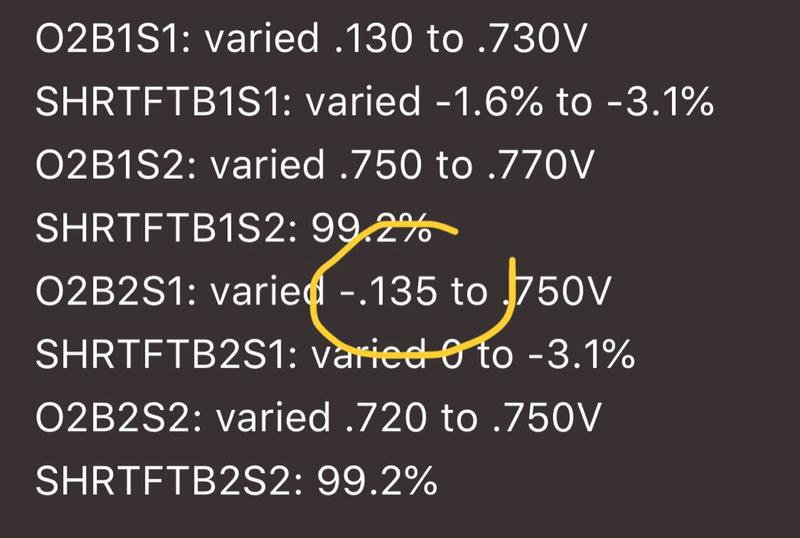 If you viewed the video that I posted you will see that for the voltage on the 02 sensor (actual screenshot of Torque Pro live data), starts at 0 and goes from there. It can not go into the negative value. It will be the same as if you drove your X in reverse and the speedometer will read a negative value which we all know it doesn't. It was showing a negative value. I don't even know how that's possible to even display much less have an actual negative value. Cross talk from a near-short. If the number still shows neg on the same sensor I would take the DME out and open and clean the traces. I have a photo with the traces that go to the heater controllers: some gunk on the traces or some gunk in the connector could cause an odd reading like that. What type of scanner are you using? Schwaben. Same as the Foxwell. After previously posting and doing a clearing of adaptations and DME re-calibration I was still getting the same readings off the OBDII. So, I did the adaptation clearing and DME re-calibration again, this time being very careful to exactly follow the procedures directed by the scanner. The SES light has not returned. A scan of the OBDII is now showing what looks more like normal readings that would be expected. I think I may have solved my problem. Knock wood. I had same problem/ish and did the same and it worked for like six months and came back. I'm suspecting i now actually have a vacuum leak or bum MAF. I'll probably finally make/rent/buy a smoke tester and if no smoke, i'll swap MAF back from wife's car to see if there is a change. I did notice in my case that six mo. ago when i originally did like above and swap MAF with wife, the fuel trims were more like +6, ±1% (short/long) and now there are both showing like +5 +7, so the computer is definitely seeing too much air or too little fuel. what are your fuel trims now showing? if the long term is close to zero i think you're golden. I think i just acquired a new vacuum leak not the same problem returning.